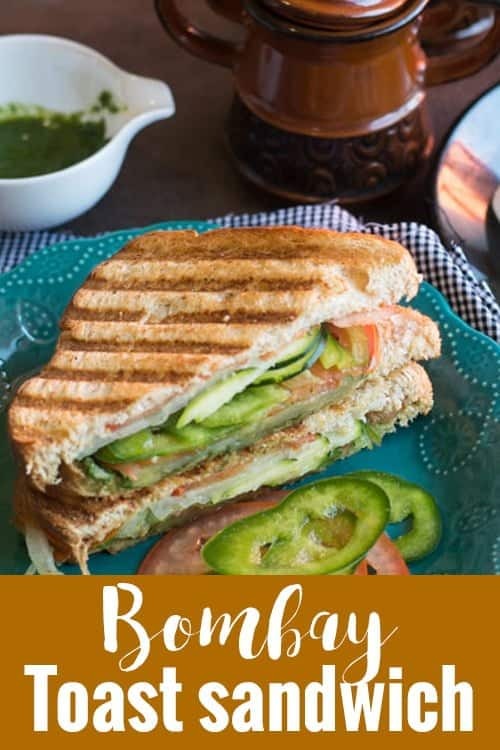 Healthy Bombay toast sandwich recipe is an easy breakfast that does not require any cooking that you can make easily in the morning hours. Not only that but also a very good food for the entire family. In addition, this dish is made very healthy with loaded with vegetables but made in a simple way. Bombay toast sandwich recipe became our favorite since my childhood. In fact, this is one of the first few recipes which I made when I bought griller of my own. The best and important part of this recipe is that it does not require any cooking skills that anyone can make it. And this recipe is versatile and can be modified according to everyone’s own individual preference. Why are you waiting? make this super simple recipe and start your day healthy and energetic. What is Bombay Toast sandwich? This Sandwich got the name for the place this recipe is famous for. Bombay is one of the four metro cities in India. And this toast is the very popular street side dish. The street side vendors make this very delicious and the toast they serve is rich and spicy. How to make authentic Bombay toast Sandwich Recipe? Here I shared the healthy version of this sandwich by avoiding butter and cheese. But if you are planning to serve the original version of Bombay toast, then spread a tablespoon of butter to the bread and add grated cheese as the top layer. Can I make Bombay toast sandwich without griller? Yes, In the absence of griller, You can make it stovetop using your frying pan. It is important to say that you will get the same taste and texture with this method. But only that nice grilling marks will be missing. Can you toast bread sandwich in a microwave? I have never tried making it in the microwave, I normally avoid using the one for any of my recipes. But you may refer this microwave method of making this recipe. 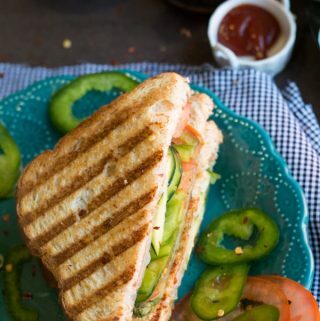 How to reduce the time in making this sandwich? This recipe required a boiled potato, and you may use the refrigerated one. So you can make it ahead or You can reserve a cooked potato from any of your previous dishes. You can make ahead and refrigerate the green chutney. And use it to make this recipe whenever you prefer. Can I store the leftover green chutney? Yes, store the leftover green chutney in the airtight container and refrigerate it. It may be good for 4-5 days if stored this way. Can I use bread toast with paneer? Yes, it is another healthy ingredient to be added to the toast. It makes dish protein-rich, and the very good option to start a day with protein-rich breakfast. 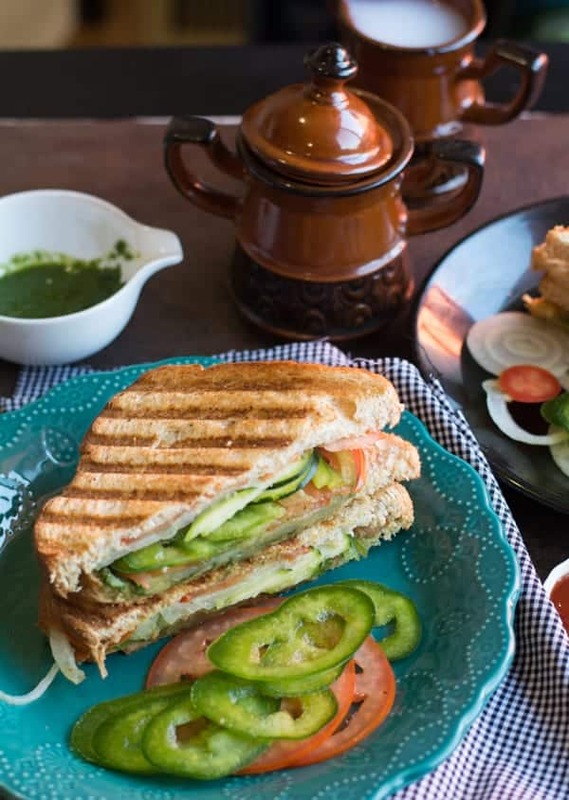 Healthy Bombay toast sandwich recipe is an easy breakfast that does not require any cooking that you can make easily in the morning hours. Not only that but also a very good food for the entire family. In the mixer grinder add all the ingredients listed for the green chutney. Grind it until it becomes a spoon paste. Keep it aside. Spread the green chutney over 2 bread slices. Arrange all the vegetable slices in the order of potato onion, cucumber, tomato, capsicum. Close it with another bread slice and grill. Serve immediately with tomato ketchup or with the leftover green chutney. This looks good! We eat sandwiches (Smorgas) for breakfast often, but our Smorgas is a bit different. For me, finding the chat masala may prove the biggest problem. I can however buy a pre-made Indian green chutney, so I’ll give it a try.